In geostationary orbit high above the Pacific Ocean is International Rescue's space station Thunderbird 5. 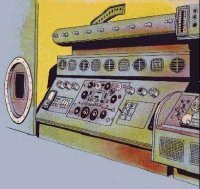 Crewed by John Tracy, TB5 features sophisticated communications equipment that allows TB5 to simultaneously monitor all transmissions made from earth. Automatic translators and filters ensure that any distress calls are immediately identified. The space station's position over the Pacific ensures that it is in contact with Tracy Island 24 hours a day, whilst the anti-radar devices in the ring around the station keep its location secret. Also located in the ring are the magnetic pole unit and the plasma core localised field meteor deflector. A twin hull construction filled with coagulant compound protects the station from micro-meteor punctures. TB5 is serviced by Thunderbird 3 and Alan Tracy provides relief for John once every month. Docking with TB3 is fully computerised and the station carries fuel and supplies for TB3. Accommodation for several people is provided for when it is required. The top mounted astrodome features a state-of-the-art telescope which John uses for his study of the stars during quiet periods.